Distressed detailing to graceful grapevine carvings, giving this free-standing cabinet an elegant air of French Country charm. 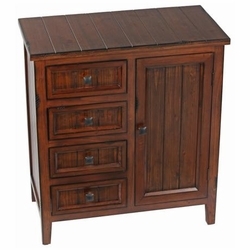 This timeless four-drawer wood chest will add handsome, traditional style to your home. A beautiful design for seating areas or hallways. In a dark cherry finish with slatted door fronts and top. Drawers and one door are perfect for storing keepsakes or valuables. Measures 16 3/4¡å x 10 3/4¡å x 28¡å high.